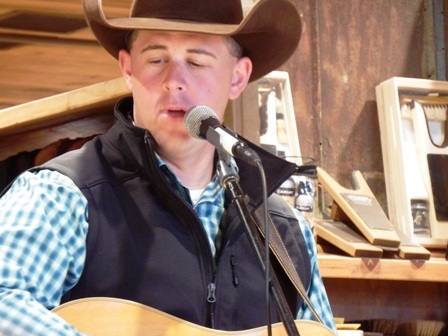 Cowboy church offers an opportunity to worship non-traditionally. This "come as you are" service reaches out to those who are not in church on a regular basis, as well as members attend every Sunday. 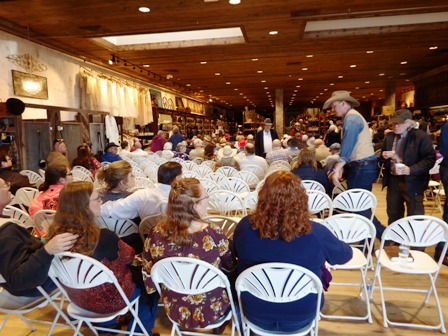 Those who may not be comfortable walking into a church setting may be more at ease walking into a western store. 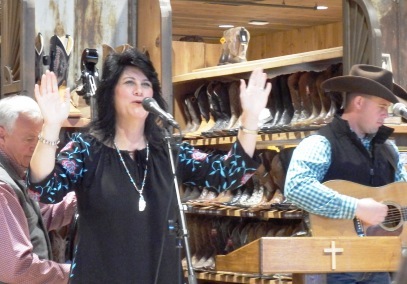 Cowboy Church is one of the most awe-inspiring services held in the Great Smoky Mountains area! 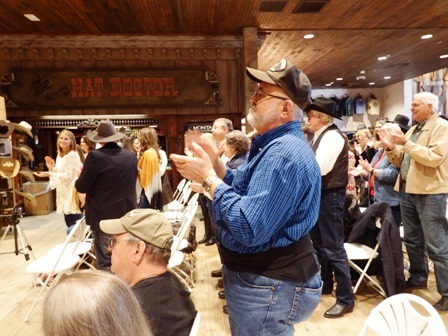 This worship service, held annually at Stages West Western Store in Pigeon Forge, offers an awesome time of praise! There's plenty of singing, shouting, and old-time preaching. From beginning to end, the service is a time of celebration filled with "spirit-filled worship. The event normally begins on a Sunday morning at 8:00 A.M with a delicious Chuck Wagon breakfast served until 10:00 a.m. The cost for the meal is $5.00 and well worth it! 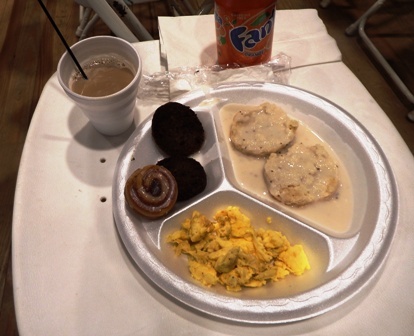 Cowboys and Cowgirls enjoy biscuits smothered in white gravy, scrambled eggs, sausage patties, and a choice of drink including coffee, milk, soft drinks, or water. 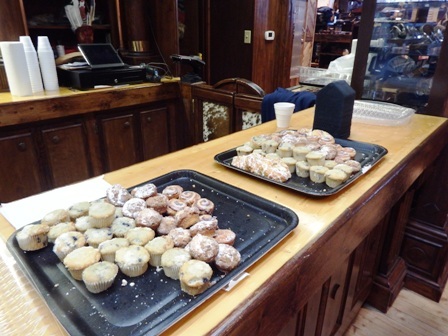 There is also a snack bar inside Stages West filled with coffee and delicious pastries of most every kind. The service begins with song and praise worship followed by an "on fire" message by a visiting evangelist. The Spirit of the Lord is experienced strongly through hand-clapping, singing, and shouting throughout the whole service. The most amazing part of the service takes place at the end as people are touched by the Holy Spirit by making professions of faith and becoming super-naturally healed of their ailments. Cowboy Church is part of a two-day week-end event held every year around the beginning of March. It's inclusive with the Chuck Wagon Cook-off held on Saturday before the worship event on Sunday. Everyone is welcome to attend these events free of charge (excluding meals.) Come dressed in your regular attire, or enjoy dressing in your cowboy/cowgirl attire. This church style became popular in the 1970's. It first began in the cowboy community with all those involved in the pro-rodeo circuit. 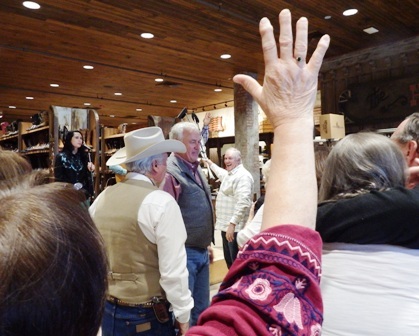 It was emphasized within the cowboy culture and designed to reach the cowboy/cowgirl community. It's trend is closely related to biker churches and trucker churches. Cowboy churches have been in existence for more than 50 years all over the U.S. This way of worship has moved forward by reaching out to others and spreading the gospel of Christ in a non-traditional, comfortable setting. It is open to all denominations.